Specifically designed for sheet metal ducts used in heating, ventilating, and air conditioning in North America. It provides an optimum combination of efficient sound absorption, low thermal conductivity, and minimal airstream surface friction. Wall & Ceiling Liner is designed for use as an acoustical and visual barrier for walls and ceilings where a black surface is required. It is primarily used in theaters, sound studios, public concourses and other areas where acoustical treatment is needed. Insulation is delivered to the installation site as one packaged bag containing varying amounts of product. At the installation site, insulation products are unpackaged and installed. STape may be used to install duct liner. No material is lost or wasted because scraps are typically used to fill corners or crevices. Packaging waste, made up of paper and plastic, is disposed (plastic: 15% to recycling, 68% to landfill, and 17% to incineration; paper: 75% to recycling, 20% to landfill, and 5% to incineration), and no maintenance or replacement is required to achieve the product's life span. After removal, the insulation is assumed to be landfilled. The manufacturing stage dominates the results for the acidification, global warming, ozone depletion, smog, ecotoxicity, and fossil fuel depletion impact categories. 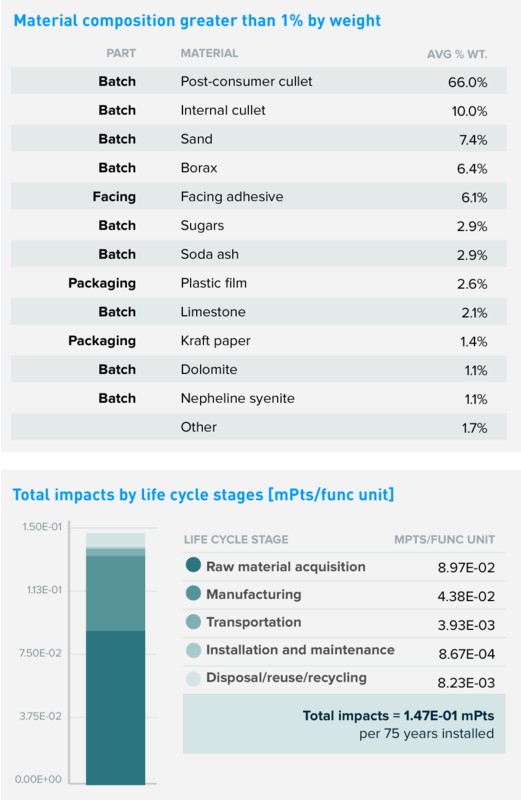 The remaining impact categories are dominated by the raw materials acquisition stage. Following these two stages, the next highest impacts come from transportation and disposal, which have a similar contribution. However, for smog, the transportation stage is the second highest contributor due to the use of trucks and rail transport. The impact of the raw material acquisition stage is mostly due to the borax, manganese dioxide, and soda ash in the batch and the dextrose in the binder. Since sand and borax are melted in the oven, they are not released into the air as fine particulates and therefore likely actually contribute less than what is calculated in the results tables below. The manufacturing stage shows major contributions to all impact categories. The landfilling of the discarded product contributes to the disposal stage. The only impacts associated with installation and maintenance are due to the disposal of packaging waste, which is the smallest contributor of all the stages. Atmosphere™ Duct Liner and Wall & Ceiling Liner use a special formaldehyde-free black non-woven facer material.